mixed together with some nice ideas. Anything from an ancient tea ceremony to a map of the burbs, Twist specialises in customised illustrations and graphics that will give your next project that extra lift. Need a dash of humour or perhaps something more meaningful? What about a nicely designed poster with that? It's all about communication, so Brisbane based illustrator and designer Greg Jackson will work with you to create that ideal visual solution, no matter where you live on this planet. For a wide variety of illustration styles and projects, check out the categories in the illustration section. If you're in the advertising, film or animation fields perhaps you'll be needing some snappy storyboards. I can also professionally design and manage small to medium print promotions and websites. And if your message needs to move and groove, check out the animation section. but it might change your mind!" 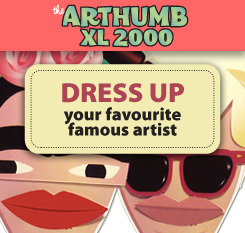 Got your Arthumb XL 2000? Now it's time to have some more fun! Click the image to find out how. Go on! In my never-ending battle to attract and bemuse new clients, here is my latest promotional postcard. You might have one, but if not contact me and I'll post you one!